Sahaja Yoga meditation was developed by Shri Mataji Nirmala Devi. It involves the awakening of a subtle, spiritual energy, called the Kundalini, that lies dormant in the sacrum bone in three and a half coils. One can actually feel the awakening of this energy as a cool breeze on top of the head. The gentle awakening of this Kundalini energy and the inner journey of self-discovery is known as enlightenment (or Self-realization). “Sahaja” means “spontaneous” or “born with you”, and “yoga” translates as “union” (with the Divine or all-pervading power). “Sahaja Yoga” then translates as “the method of divine union through yoga which everyone is born with”. It brings about a spiritual evolution within us, and as a result, in our society. The more we meditate, the better we are able to achieve physical, mental, emotional, and spiritual balance. Our lives are filled with joy and we attain the strength to face all adversities in life. Our emotional intelligence increases and we become conscientious. Sahaja Yoga inspires honesty, integrity, and love by germinating the seed of goodness within the individual. In Sanskrit language, “sahaja” means “with” and “ja” means “inborn”. Born with you is the fundamental right to get yoga, which is the union with the all-pervading power. This union is the first step in Sahaja Yoga and is called “Self-realization”. It manifests as the feeling of a cool or warm breeze (called vibrations) on the palms of our hands and/or the fontanel bone area above our heads. Self-realization is the birthright of all human beings, regardless of their race, nationality, or religion. During the process of Self-realization, the Kundalini rises, piercing through the various energy centers. Once it pierces through the seventh center (sahasrara), we feel a cool or warm breeze (vibrations) on the palms of our hands and the crown of our head. A warm breeze means obstruction in one or more of the chakras. Employing simple clearing techniques, we can remove any obstruction that we feel in our chakras. As the obstructions clear, more and more strands of Kundalini rise and we are able to enter into a deeper state of meditation. 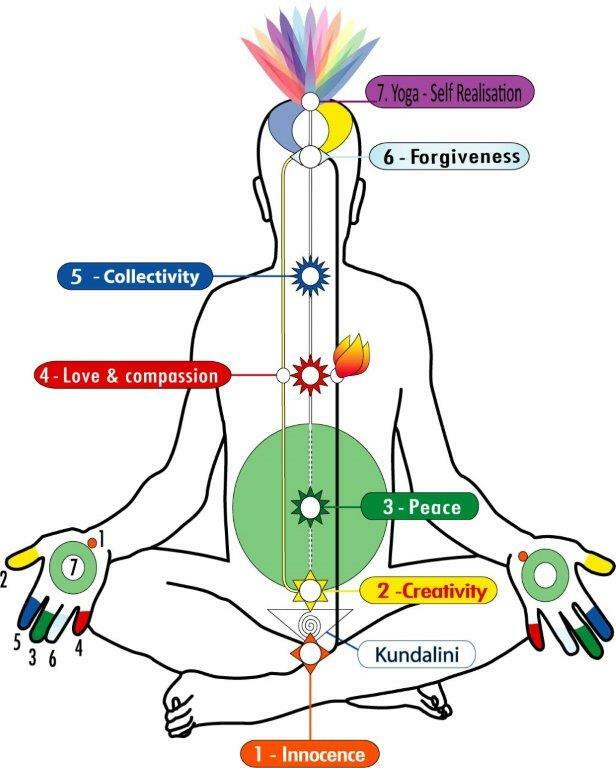 When our meditation grows deeper, the health of our chakras improve. As a by-product, we become joyful, loving, and compassionate.